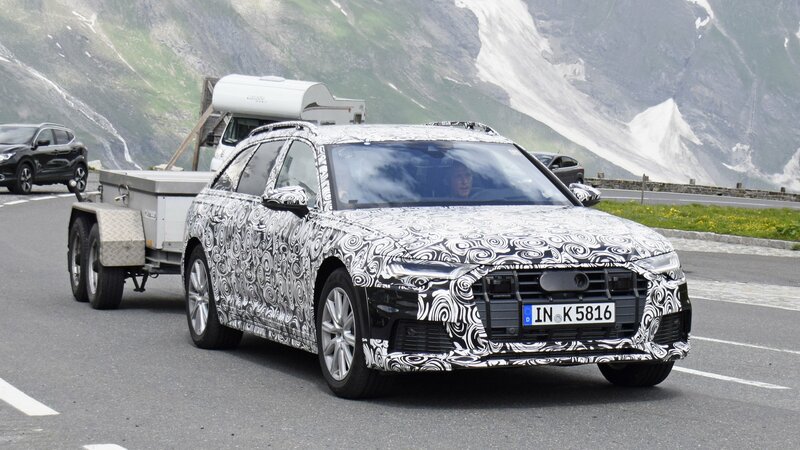 A prototype version of the new Audi A6 Allroad has been spotted on a test run, suggesting that we could be close to seeing the new model make its debut. While it does look like an old test mule for the Audi A6 Avant, there’s no question that this is the A6 Allroad given how much higher it rides compared to the Avant and the base A6 sedan. 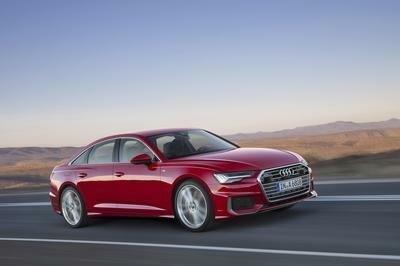 After seven years on the market, the seventh-generation Audi A6, also known as the C7, was finally retired in 2018, making way for a much-improved midsize sedan from the Ingolstadt-based automaker. Redesigned to look more modern inside and out and fitted with all the fancy tech that it needs to go against the competition, including semi-autonomous capability. With the A6 sedan unveiled to the world at the 2018 Geneva Motor Show, Audi quietly revealed the wagon version, also known as the A6 Avant. Just like its predecessor, the Avant takes all of its design features and tech from the sedan model. The key difference here is the longer roof and the bigger trunk, which makes the Avant more practical for drivers who haul stuff on a regular basis and an ideal family vacation car. It’s as practical as any midsize wagon out there, but it comes with premium comfort features and the latest safety technology. Does it have what it takes to compete against the Mercedes-Benz E-Class Wagon and the BMW 5 Series Touring? Let’s find out in the review below. Continue reading to learn more about the Audi A6 Avant. The mid-2000s brought a new generation of Audi vehicles that took the company to new heights. Although the entire lineup shared the same design language that wasn’t exactly exciting, the simple and elegant looks, the solid tech packages, and the good performance brought more and more people into Audi dealerships. The Germans began revamping the lineup in 2015 with the Q7 SUV and, by late 2017, we saw a host of updated models on the road, including the A4, R8, and A8. Come 2018 and Audi has launched the new A6, Ingolstadt’s main weapon against the brand-new BMW 5 Series and recently launched (and innovative) Mercedes-Benz E-Class. As expected, design changes are far from radical, which is why we’re taking a closer look at both generations in the comparison below. 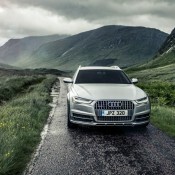 The A6 remains familiar with the lineup, but it’s also very similar to its predecessor. 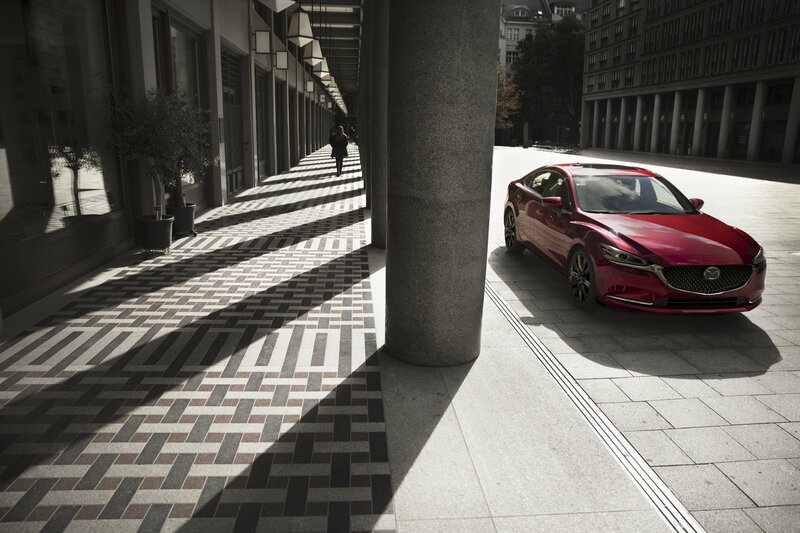 The sharper lines don’t alter the exterior beyond recognition, but it gives the sedan a modern twist. The revised four-door comes in a bit more aggressive too thanks to larger vents in the bumpers and a bigger front grille. 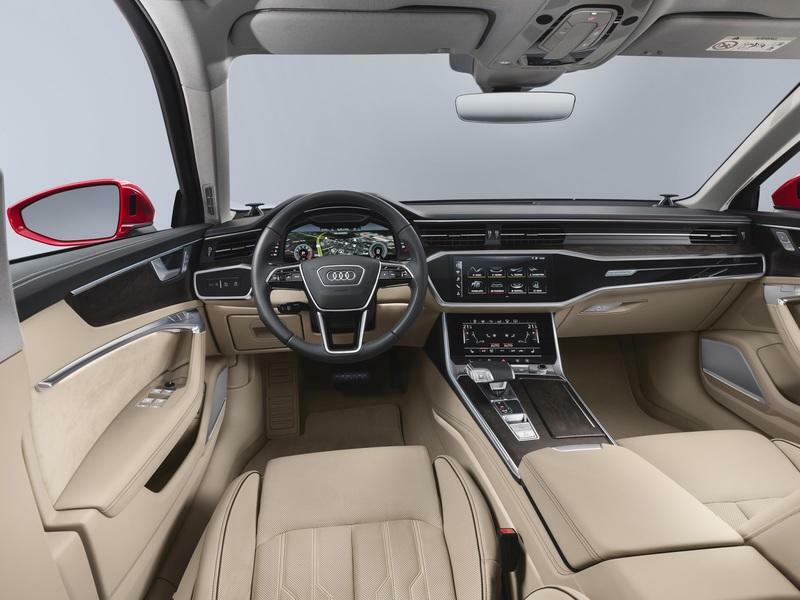 The interior is indeed quite different, as Audi ditched every single element that made the A6 look modern in 2010, but long in the tooth in 2018. Let’s take a closer look at the changes. The “same sausage, different length” strategy is quite common among mainstream automakers nowadays, but Audi is one of the few companies that actually managed to keep its new-generation cars (starting with the latest Q7) very similar to their predecessors. Sure, they all gained more angular body features, but other than that, they look very, very familiar. This is even more noticeable on the new A6, starting with the front fascia. The first thing that catches the eye is the wider, more aggressive grille. Borrowed from the latest A8, it has thicker chrome trim and a more angular frame. The bumper has taller intakes on each side and a wider central vent, but other than that, it retains the familiar three-piece layout. The headlamps also have a similar shape. They’re a bit shorter and the inner section is narrower, but it’s easy to confuse them with the old design. The LED layout is different though. The same goes for the side view, which hasn’t change much except for a few tiny details. The most striking thing, in a bad way, is that Audi left the roof and the pillars untouched. Okay, maybe we can find a few extra inches here and there, but without using precision instruments, the roof looks the same on the new car. That’s one thing I would have changed, mostly because the A6 looks very generic. It’s not as sporty as the A7, but also not as elegant as the A8. It’s too generic, it has no message to deliver. It’s meh. Small changes aside, the fenders look the same too, as do the front and rear doors. It’s the lower body that looks a bit different, with more noticeable character lines just above the side skirts. The beltline was also revised. 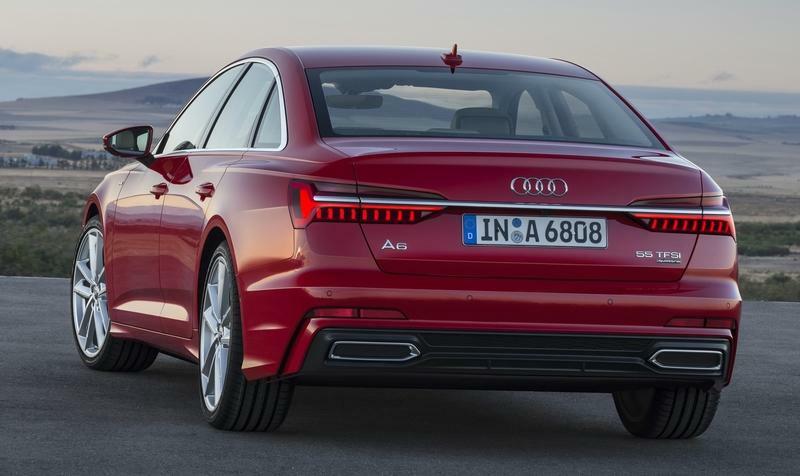 While the previous model has an almost straight line running from the front to the rear, the new A6 has subtle arches at the top of each fenders. This new details gives the car a more muscular look and it’s a breath of fresh air on an Audi model. The rear fascia is one area of the previous A6 that I actually like. And Audi changed it. The modifications are visible right at the top, where the trunklid spoiler is milder. Unlike the headlamps, the taillights are completely new. They are wider on the outside and thinner toward the license plate, now also integrating a chrome strips that runs the entire width of the trunk lid. The lower fascia is no longer pushed deep into the body, which gives the rear and a rather mundane look. The bumper continues to have a muscular look, but it also gained red lights above the diffuser. The latter sports minor changes. All told, the previous A6 looked sporty from the rear and somehow Audi managed to kill that look. Unfortunately, it’s not very elegant either, so it’s not the best trade. 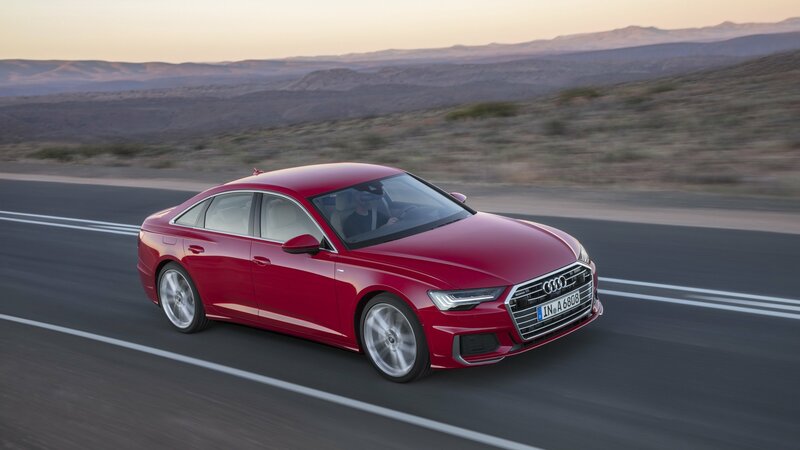 Seven years old as of 2018, the A6 was beginning to look a bit dated inside the cabin and a complete redesign was mandatory. Fortunately, Audi took all the necessary measures and changed just about everything. The two-tier dashboard is spectacular, as it combines the company’s new continuous airvent strip at the top and a big piano black element below. The latter also incorporates the big infotainment screen and it’s flanked by wood veneer above and leather-wrapped surfaces below. The center console is just as wide as on the outgoing model, but it sports a more modern look and a big veneer surface where the gear shifter is placed. The all-digital interface for the HVAC system adds to the high-tech look of the center stack. The all-digital instrument cluster provides a better look at the complex navigation system alongside the rev counter, speedometer, and other performance data. The new door panels are fancier than ever, now combining leather in various colors, aluminum trim, and genuine wood veneer. 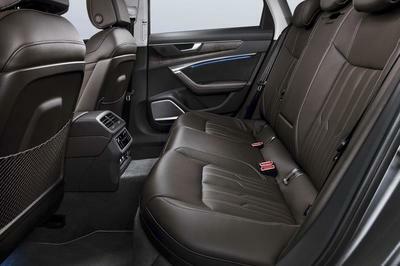 The new cabin is rounded by improvements in legroom, headroom, and shoulder room for both front and rear passengers. A significant departure from the old model overall. Read our full review on the 2019 Audi A8. Audi first introduced the A6 nameplate in 1994 as a replacement for the outgoing Audi 100. Since then, the German automaker has ushered in a total of four generations for the model, with the current-gen dropping in 2011. 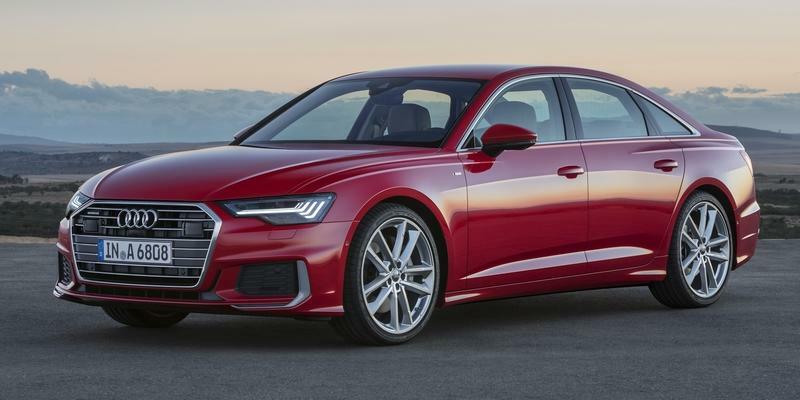 Of course, seven years is a long time for just about any vehicle generation, and as such, Audi is prepping a fifth-generation A6 for the 2019 model year (Audi is calling it the “eighth generation,” but we aren’t counting the refreshes as entire generations). Scheduled to appear in the metal at the 2018 Geneva International Motor Show, Audi likes to frame the mid-size premium sedan as the “multitalent in the luxury class,” bringing a healthy mix of style, sportiness, opulence, and technology, all in a comfortable four-door package. And, as you might expect with a generational changeover, the 2019 model year brings a few styling changes outside, a brand-new interior layout, a fresh suite of convenience and connectivity features, and a mild-hybrid upgrade for the powertrain, not to mention a variety of suspension set-ups and standard quattro AWD grip, all of which help to underline the model’s do-it-all attitude. The A6 is offered in a variety of body styles and configurations, and as such, this generational shift will undoubtedly trickle down to several corners of Audi’s product portfolio. We’re still waiting on a few details regarding the U.S.-bound model, but in the meantime, read on for the latest. Continue reading to learn more about the 2019 Audi A6. 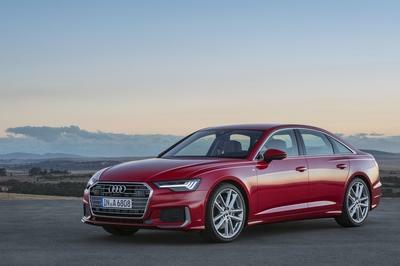 In terms of exterior aesthetics, the 2019 Audi A6 takes its cues from the new A7 Sportback and A8, employing the brand’s latest styling language as originally laid out by the Audi prologue concept that debuted at the 2014 Los Angeles Auto Show. The new Audi A6 builds on the previous model’s styling with sharper lines, harder angles, and beefier details, and although the styling isn’t a total reboot compared to the outgoing model, it’s still different enough to warrant the “all-new” label the brand is giving it, and that’s something we’re not used to coming from Audi. In front, the first thing you’ll notice is the brand’s characteristic Singleframe grille, which dominates the fascia thanks to a thick polished metal surround and horizontal divider lines. Compared to the previous model year, the 2019 A6’s grille looks a bit wider and shorter, enhancing the car’s visual girth in the process. The headlight housings were also reshaped, and now get a flatter appearance plus clearly defined edges and lines compared to the slightly more rounded housings found on the outgoing model. Buyers can get theirs with the optional HD Matrix LEDs lighting elements if desired, while the standard daytime running lights stretch lengthwise across the face of the housing. The side intakes lower in the bumper are also new, and look smaller and sportier than the longer intakes of the previous model, complementing the subtle front chin spoiler. The windshield wipers get integrated washer jets. Moving around to the sides of the vehicle, we find a rather handsome sedan profile, which is typical for the German brand. There’s a long hood line, while the roof line pushes towards the tail in a sporty, forward-leaning manner. The wheelbase is long, while the overhangs are short. Bulky fender flares in the rear give the car a little extra visual muscle. A brushed metal surround keeps it classy around the windows. 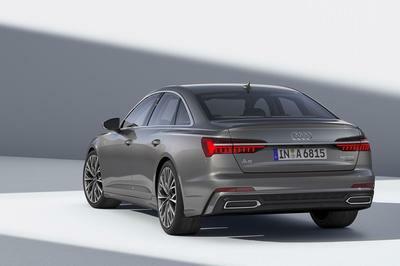 When viewed from the rear, the 2019 A6 looks quite wide indeed, with horizontal taillights sweeping in from the fender and into the trunk. Additional chrome details and highlights can be found throughout, which includes a strip connecting the taillights. Dynamic turn signals utilize the taillight graphics, while a curved trunk lid spoiler is added for optimized aero purposes. 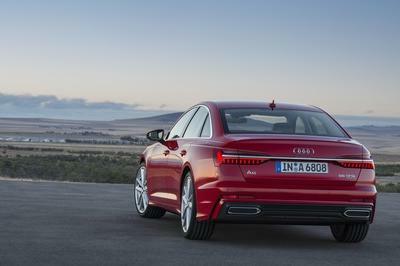 Audi even claims the A6 achieves 0.24 drag coefficient, which is right up there with such efficiency-oriented models as the Tesla Model S and Toyota Prius. The car’s revamped aero package keeps it quiet inside as well. Buyers get 14 different paint options to choose from, including seven shades just added for the 2019 model year. Further customization options can be had with the various sport and exterior design packages, as well as the more aggressive S line pack. It’s also worth noting that the A6 is most definitely not a small car, especially when talking about the even-larger fifth-gen vehicle, which gains size in every dimension. Total length now comes to 16.2 feet, an increase of 7 mm compared to the outgoing model. The 2019 Audi A6 is also 6.2 feet wide, an increase of 12 mm, and 4.8 feet tall, 2 mm taller than before. Much like the exterior styling, the 2019 Audi A6’s interior changes it up a good deal compared to the outgoing model. While the cabin still emphasizes Audi’s penchant for horizontal design, the dash and center console are totally new, with the myriad of hard buttons and knobs replaced with touch-sensitive screens. We think these deep black panels look fantastic, and do well to give the interior an even cleaner, yet high-tech appearance that seamlessly blends with the traditional wood paneling stretching from door to door. Well done on that front, Audi. The controls are tilted towards the driver slightly to offer easier operation. There’s also a new seat design, which offers features like optional ventilation and massage functions. In addition to wood, aluminum tops the materials list for the interior, seen prominently with the automatic transmission lever on the central tunnel. Now let’s get into those new touch panels we were just raving about. The display on top of the dash measures in at 10.1 inches in the diagonal, and offers controls for the MMI navigation system (more on that in a bit). Just below it is a 8.6-inch display in the center console, which is used for climate control, text input, and other convenience functions. Go for the MMI navigation plus package, and you’ll find a third screen just behind the steering wheel. Dubbed the Audi virtual cockpit, this is essentially a 12.3-inch digital readout which replaces the traditional analogue gauges, providing vitals like road speed and navigation instructions. There’s also a heads-up display that can project further info onto the windshield. 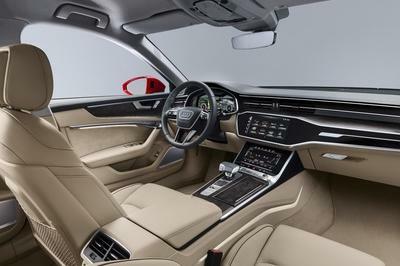 All told, the 2019 Audi A6’s interior is much more high-tech. Thanks to those screens we just mentioned, the old rotary controls are gone, making for what Audi is calling an all-digital MMI touch response infotainment system. There’s even an option to replace the interior lighting and multi-function hard buttons with touch response bits as well. What’s more, the MMI touch response system offers haptic and acoustic feedback to assure you that your input was indeed received. If you can’t be bothered to lift a finger, there’s also intelligent voice control, which links with the onboard data and MMI navigation systems for more robust phrase recognition. Audi says the onboard systems are fully customizable, with as many as 400 different parameters to tweak and tune to your taste. That includes drag-and-drop functionality to personalize the various vehicle control icons, configured into a tile-like layout that’s meant to mimic a smartphone. A variety of shortcuts and favorites make it all a little quicker to navigate, and there are as many as seven profiles for the various settings, which is great when multiple drivers are using the same vehicle. MMI navigation is standard, while an LTE Advanced web link is used for connectivity and data transfer purposes. Step up to MMI navigation plus, and Audi tosses in a learning function that will provide smart search and custom navigation based on your frequent routes, while route guidance from HERE comes with real-time traffic info. Each buyer also gets six months of complimentary map updates as standard with the navigation plus package. The Audi phone box provides mobile device support, while the myAudi app provides easy access to the various features from your device of choice. The optional digital key feature allows Android users to lock and unlock the doors and remotely start, with up five users supported for even greater sharing capability. And of course, no modern luxury car would be complete without the various semi-autonomous assistance features. As such, the 2019 Audi A6 comes with parking pilot and garage pilot as part of the Park assist package, making it easier to get in and out of tight spots. There’s also the City assist package with crossing assist, and the Tour assist package with adaptive cruise control plus lane-keep assist and efficiency assist. Running it all is a central driver assistance controller that “calculates continuously a detailed model of the environment from a fusion of sensor data” provided by as many as five visual cameras, five radar sensors, 12 ultrasonic sensors, and a laser scanner. 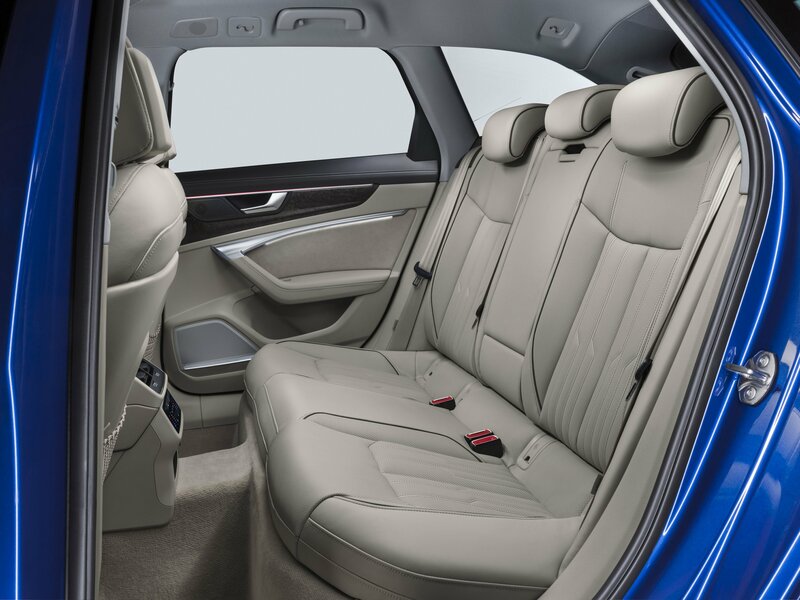 Dimensionally speaking, there’s more space inside the 2019 model year compared to the outgoing model, with increased legroom in the rear, plus extra headroom and shoulder room front to back. The trunk can accommodate two golf bags, with a volume of 18.7 cubic feet total, while a kick under the bumper is all that’s needed to electrically open the trunk lid. 3D sound (right to left, as well as top to bottom). Further available equipment includes an air quality package with an added air fragrance, air ionizer, and a more effective filter, an optional panoramic glass sunroof, and an optional heated windshield. Finally, there two interior lighting packages on the table, including the ambient lighting package and the contour ambient lighting package, the latter of which offers 30 different light colors. There’s also five interior schemes to choose from, including basic, sport, design, design selection, and S line sport package. Each gets unique colors and materials, such as open-pore wood and leather upholstery. 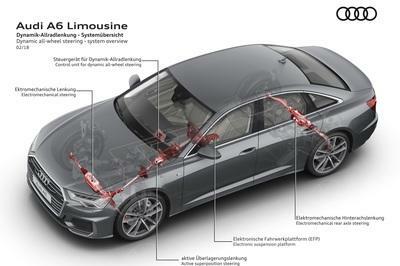 The big news in the drivetrain department in undoubtedly the fact that each engine configuration in the 2019 Audi A6 gets mild-hybrid assistance as standard. Utilizing a belt alternator starter and lithium-ion battery, this set-up can recover up to 12 kW of energy on deceleration, which Audi says can provide as much as 0.7 liters of gas per 100 km. Further efficiency enhancers include a coasting function between 34 mph and 99 mph, as well as a start-stop function that works at speeds up to 13.7 mph and will predicatively start the engine as soon as the car ahead starts moving thanks to the A6’s various onboard sensors. In Europe, the engine options include one diesel powerplant and one gasoline powerplant, both of which get quattro AWD as standard. The gas burner is composed of a 3.0-liter TFSI V-6, which is turbocharged to produce 340 horsepower and 369 pound-feet of torque. 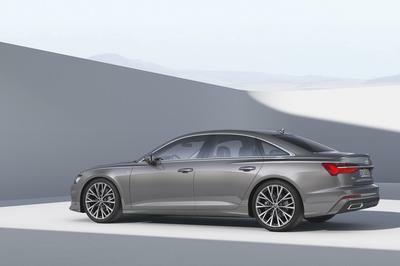 Mated to a seven-speed S tronic automatic transmission, the A6 will do the 0-to-62 mph sprint in 5.1 seconds and reach an electronically limited top speed of 155 mph. It also provides a combined fuel consumption up to 35.1 mpg thanks in part to Audi’s Ultra technology, which deactivates the rear drive wheels to run a more efficient FWD configuration. Next up is the oil burner, which also gets three liters of displacement, six cylinders, and a turbocharger to its name. Output this time around comes to 286 horsepower and 457 pound-feet of torque, all of which is routed towards the ground through an eight-speed Tiptronic transmission and self-locking center differential. Fuel returns come to 43 mpg combined. While Audi has yet to release specs for the U.S.-bound engine configurations, we’ll almost definitely get just the gasoline engine option. After the initial release, we might get a few other four- and six-cylinder options as well. And since the A6 is supposedly a do-anything sort of luxury sedan, it gets an optional sport differential for the rear axle, which integrates with the adaptive suspension (if equipped) and damping system for a more entertaining handling experience. To go with all the aesthetic equipment changes, the 2019 A6 also gets a few updates to the hard bits under the skin. Audi claims the new A6 is sportier than the model that came before, while also offering an “improved ride and noise comfort,” mostly thanks to a few well-executed suspension and chassis tweaks. The bones of the machine are made from steel and aluminum, the right stuff to keep it as stiff and light as possible. And, in case you didn’t know, stiffness and lightness are vital to how a car handles and feels on the road, both from a comfort and a performance perspective. To that end, more aluminum is used for the doors, hood lid, trunk lid, and fenders, plus there’s a good amount of the alloy for the suspension components, such as the fixed brake calipers in front and front suspension strut dome. The A6 offers four different suspension set-ups, including the base steel springs, a stiffer sport suspension, the upgraded damper control, and the top-of-the-line adaptive air suspension with controlled damping. The 2019 Audi A6 also comes with all-wheel steering, with the rear wheels angling by as much as 5 degrees. When traveling at low speeds, the rear wheels will turn in the opposite direction of the steering wheel, which helps to reduce the turning circle by 3.6 feet, down to 36.4 feet overall. At higher speeds, the wheels turn in the same direction as those in front, enhancing stability and comfort when you need them most. Speaking of turning the wheel, the 2019 A6 comes with a standard progressive steering system, with a ratio that varies between 9.5:1 and 16.5:1. The higher the angle of steering input, the more response you get in the direction change. Finally, the A6 gets bigger wheels this time around – up to 21 inches in diameter, with tire sizing rated at 255/35. And if you really want your Audi to feel like its on rails, go for the S line sport package, which throws in 19-inch wheels and that stiffer sport suspension we already mentioned. 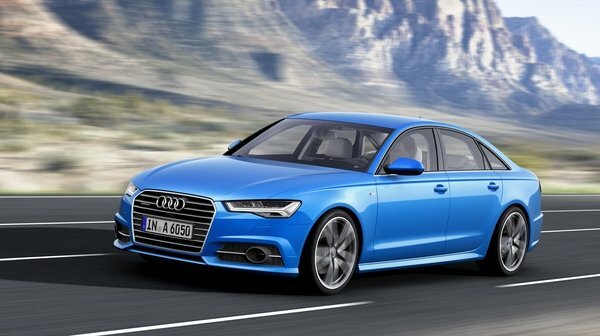 The 2019 Audi A6 launches in the German market this June, and will start at 58,050 euros. A U.S. release is expected sometime afterwards. Official pricing for the U.S. model is still forthcoming, but it’s expected to stay close to that of the outgoing model, which starts at just under $50,000 as of this writing (03/01/2018). First up in our list of competitors is the latest BMW 5 Series, which just got a renewed seventh generation for the 2017 model year. Highlights include a lower curb weight thanks to the inclusion of Bimmer’s carbon fiber-reinforced plastic technology, which certainly helps elevate the sedan’s claims to sporting fun. The weight loss also helps the car be more efficient, with a 2.0-liter four-cylinder and 3.0-liter inline six-cylinder on the list of powertrain options. There’s even a hybrid, if that’s your kinda thing. Both RWD and AWD are offered, with an eight-speed automatic gearbox on call for the transmission duties. The interior is also quite nice, and comes equipped with the latest technology features, including gesture control and a 10.25-inch infotainment screen on the dash. 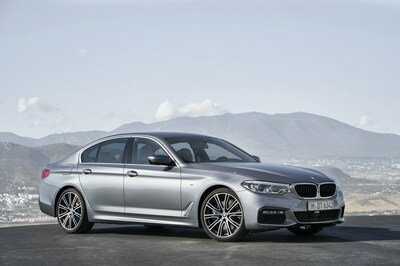 Pricing starts at $52,650 for the base model 530i. As goes BMW and Audi, so goes Mercedes. The Merc option in this mid-size premium four-door shootout is called the E-Class, which also just saw a generational changeover for the 2017 model year. We think it looks good in that classic Mercedes kind of way, while the interior is a rather nice place to be thanks to a gorgeous-looking layout and a host of S-Class-inspired features. Behind the flat-bottom steering wheel is a 12.3-inch digital screen, while a choice of 64 different colors can be had for the LED ambient lighting. Upwards of 241 horsepower and 273 pound-feet of torque is created by the base model’s turbocharged 2.0-liter ’four, which hits the rear wheels through a nine-speed automatic transmission. An AWD iteration is also offered. 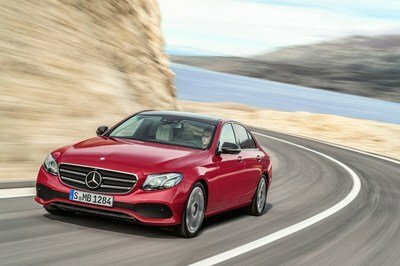 Read our full review on the 2017 Mercedes-Benz E-Class. The Audi A6 has always been a very solid choice in this segment. While it’s not quite as sporty as the Bimmer and not quite as elegant as the Mercedes, the A6 is definitely one of the smarter choices here. That characteristic is emphasized even further with the introduction of the new mild hybrid system across the lineup. More efficiency is always appreciated, even on models with a sporting angle to them, and we see it as a good indication of where Audi is headed in the future. We’re also really enjoying the interior. The plethora of screens on hand give it a fantastic new look, mixing futuristic techno-cool with Audi’s traditional luxury goodness. In fact, we’d go so far as to say the A6’s new interior can challenge that of even the E-Class in terms of refinement and design. We even like the exterior redesign. It looks fresh and sharp, and that enormous Singleframe grille is starting to grow on us a little as well. Throw in the standard quattro AWD, and you’d be hard-pressed to make a case for either of the above-listed German competitor as the more sensible buy. If you’re looking for the benefits of an SUV without actually owning one, then your best bet is probably one of Audi’s Allroad models. 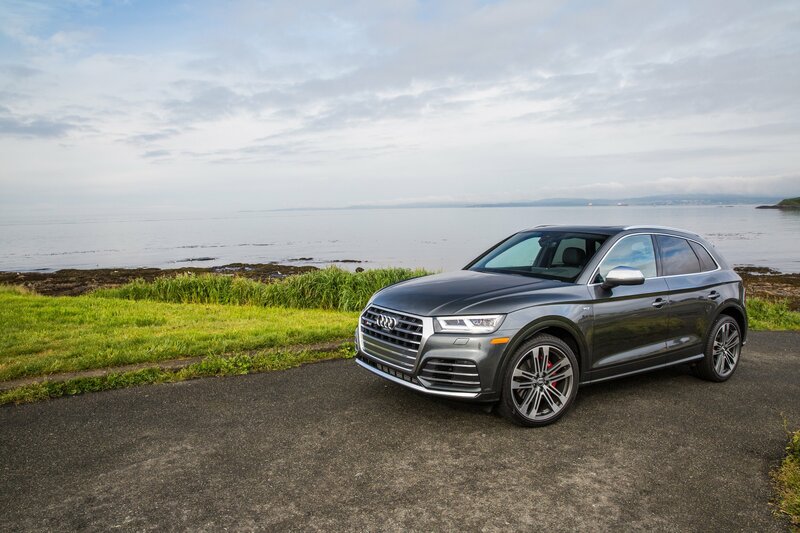 They offer all of the amenities of an SUV, like Audi’s awesome Quattro all-wheel drive system and air suspension. This means the car comes ready to tackle rough roads a lot better than most sedans out there. 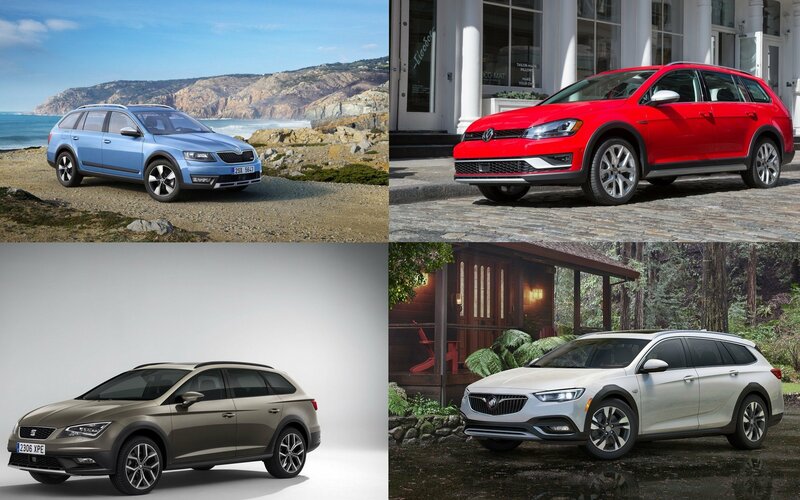 Plus, since the Allroad comes in wagon form, it offers similar cargo space in comparison to your everyday SUV. Here in the U.S., we are limited to the Audi A4 Allroad, but on the other side of the world, Audi offers the sporty Audi A6 Allroad. Just in time for winter, Audi has released a new trim level for the A6 Allroad, dubbed “Sport,” that makes the car even more sporty. Upgrades offered with the Sport trim include new wheels, new lighting, and even new seats up front. The A6 Allroad Sport doesn’t benefit from any power upgrades, but the new standard features along with the AWD system and air suspension makes the new Allroad Sport the model to have. That air suspension, by the way, automatically lowers at higher speeds to help reduce aerodynamic drag. Anyway, we decided to look at the new Allroad Sport to see just what makes it that much better, so keep reading to find out all the details. 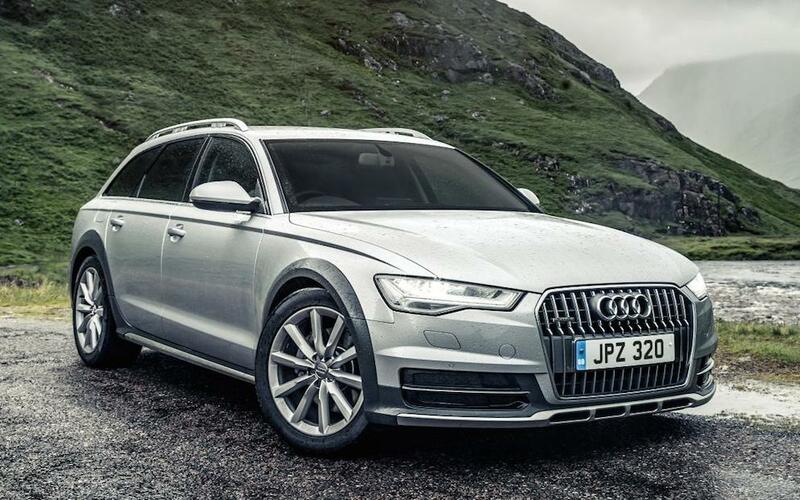 Continue reading to learn more about the Audi A6 Allroad Quattro Sport. 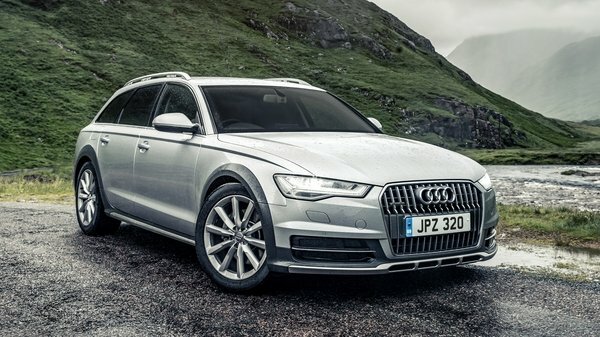 Just in time for winter Audi released a new version of their A6 allroad model, a car that fills a gap between wagons and SUVs no one really cares about. But here it is anyway, the 2016 Audi A6 allroad quattro, offering rugged capabilities of a utility vehicle in the body of an understated station wagon. 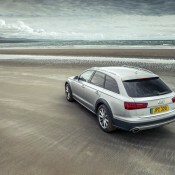 Audi A6 allroad is most often described with the words ‘jacked-up wagon’ and that’s all people tend to realize about it. But the new version does feature a lot of nice new design touches which deserve to be recognized. Some of them include full LED headlights, 10-spoke design 19-inch alloy wheels, rugged bumper garnishes and fender flares. Inside the cabin the semi-rugged theme continues with sports seats in upgraded Valcona leather and full electric adjustment complemented by luxurious Alcantara door inserts. 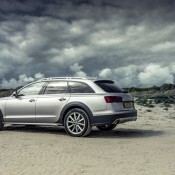 Being a family car, the allroad is also fully loaded equipment-wise, packing stuff like SD card navigation, the Audi Music Interface, powered tailgate operation, the Audi parking system plus and deluxe four-zone air conditioning. The car comes with an innovative four-level air suspension that alters the ride height depending on the conditions and a new MMI display with off-roady features like tilt angle control suitable for negotiating slopes. 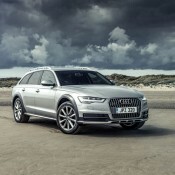 The A6 allroad can be had with three TDI diesel engines, with the 218 PS and 272 PS engines mated to a seven-speed S tronic twin-clutch transmission, and the 320 PS and 650Nm unit to an eight-speed tiptronic transmission. 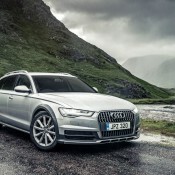 The post New Audi A6 allroad Officially Unveiled appeared first on Motorward. With the announcement of a production version of the 2012 A6 L e-Tron, Audi attempts to answer two problems posed by the Chinese luxury-car market at the same time. The first of these is something that the A6 L in its regular form already addresses, the Chinese obsession with rear legroom. But the more important issue is that of fuel economy, and this the new car does quite well. This economy comes at a bit of a price when it comes to power, but this is a car intended only for the Chinese market, and China very much has its own set of rules. The car was first shown as a concept back in 2012, and has received a few tweaks since then. 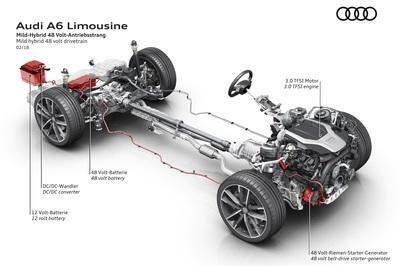 Continue reading to learn more about the 2015 Audi A6 L e-tron. Audi A6 L e-tron originally appeared on topspeed.com on Monday, 20 April 2015 16:00 EST. In 1995, Audi released the A6 as the replacement for the outgoing 100 sedan and wagon. Two years later, Audi added in a twin-turbo V-6 and a V-8 to help compensate for the wheezy naturally aspirated engine the A6 originally came with. The second-gen model arrived in 1998 and rode atop a slightly stretched version of the A4’s platform. 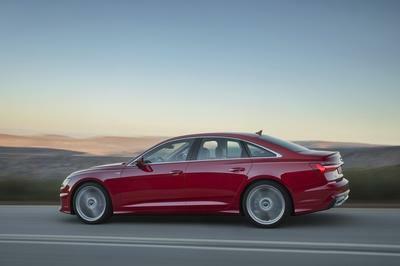 The third-generation A6 arrived in 2005, then the fourth and current-generation A6 arrived in 2012. 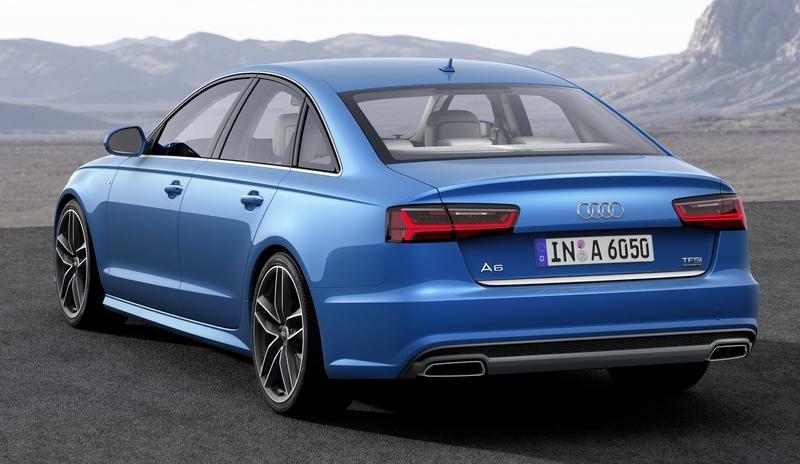 For the 2016 model year, Audi is rolling out a slightly revised version of the fourth-generation A6. 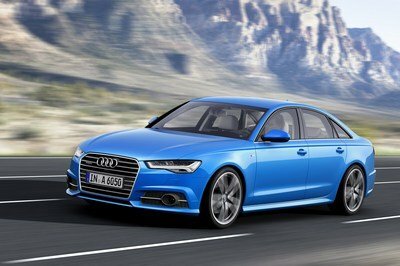 Audi’s 2016 A6 will make its U.S. debut at the LA Auto Show on November 18, 2014, but the German automaker hasn’t changed a whole lot. There’s slightly updated front and rear styling, even more luxury on the interior, three different forced induction engine options, and some new technology to enhance efficiency, safety, and infotainment. When it comes to midsize German luxury sedans, the rivalry between BMW, Mercedes, and Audi keeps each brand honest, while at the same time, creating a demand for individuation. If BMW sells itself as the performance-oriented marque, and Mercedes is the technological powerhouse, Audi typically takes the more sensible route. Its “people’s car” roots are obvious when considering the all-wheel-drive practicality, high safety standards, and roomy interior. It’s what makes the A6 the clear choice for the well-off businessperson who’s attached to the standard 2.5 children and looking for a sedan that can pull double duty as a weekday commuter and family car. Updated 04/17/2015: Audi announced prices for the 2016 A6 luxury sedan, which will arrive later this summer. 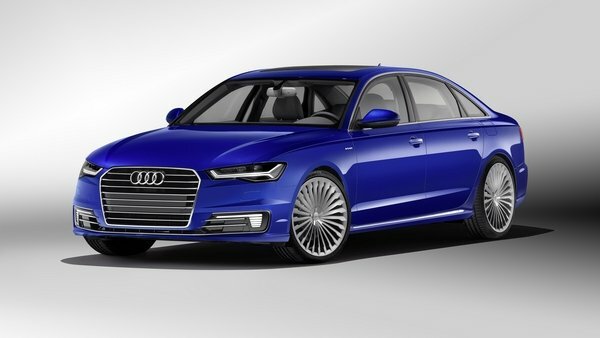 Prices will range from $46,200 for the A6 Premium edition to $75,300 for the S6 Prestige version. 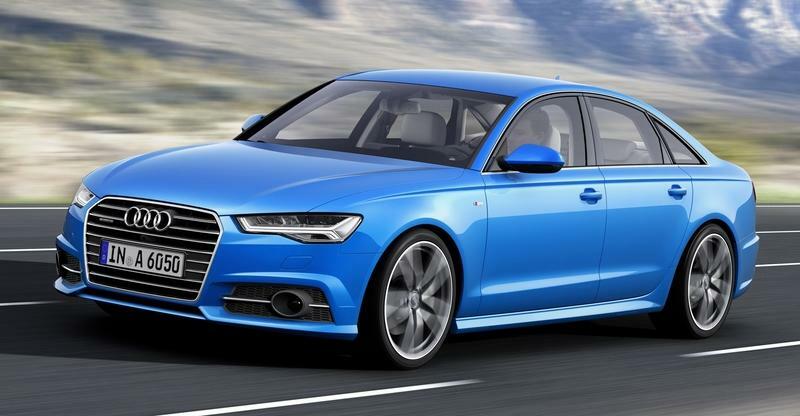 Click past the jump to read more about the 2016 Audi A6. Audi A6 originally appeared on topspeed.com on Friday, 17 April 2015 13:30 EST. Audi RS6 DTM By Jon Olsson originally appeared on topspeed.com on Tuesday, 7 April 2015 17:00 EST.